To filter your documents, click on the drop-down menu to the top right of your 'Existing Documents' that begins with 'Showing...' By default, 'Showing All Documents' will be the filter selected. From here, you will have the option to filter all of your existing documents by their Document Type. For example, if you wish to only view your existing 'Requirements Documents,' click on the 'Requirements Documents Only' filter. 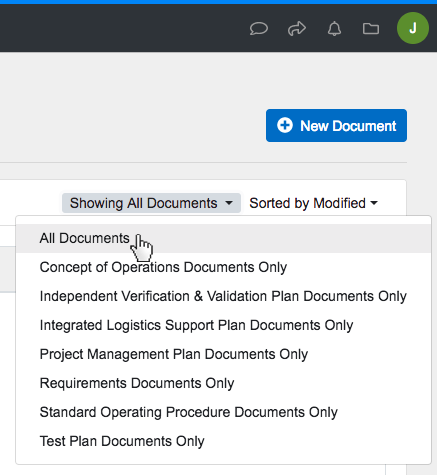 You will then be shown only existing documents of your selected type, and your filter drop-down will now say 'Showing Requirements Documents Only' (or whichever Document Type you've selected) at the top of your view. If you wish to go back to viewing all of your existing documents, simply select the 'All Documents' filter to return to your default view. To filter your documents, click on the drop-down menu to the top right of your ‘Existing Documents’ that begins with ‘Showing…’ By default, ‘Showing All Documents’ will be the filter selected. From here, you will have the option to filter all of your existing documents by their Document Type. For example, if you wish to only view your existing ‘Requirements Documents,’ click on the ‘Requirements Documents Only’ filter. 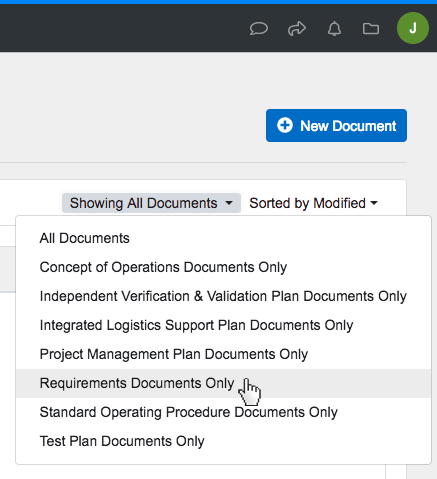 You will then be shown only existing documents of your selected type, and your filter drop-down will now say ‘Showing Requirements Documents Only’ (or whichever Document Type you’ve selected) at the top of your view. If you wish to go back to viewing all of your existing documents, simply select the ‘All Documents’ filter to return to your default view.